The last time I entered a cooking contest was twenty-seven years ago. I was seventeen and the contest, aptly, was titled the “Seventeen Magazine Now You’re Cooking Competition.” I created a Garden Party Weekend Brunch, and I’m certain I made it to the finals because of the cute theme, with bumblebee cheese-striped potatoes and flower-shaped mini quiches. Though I didn’t win the scholarship prize, it got me a free trip to New York and gave me a push toward my dappled future working in the world of food. But who knew it would one day lead me to the Minnesota State Fair? 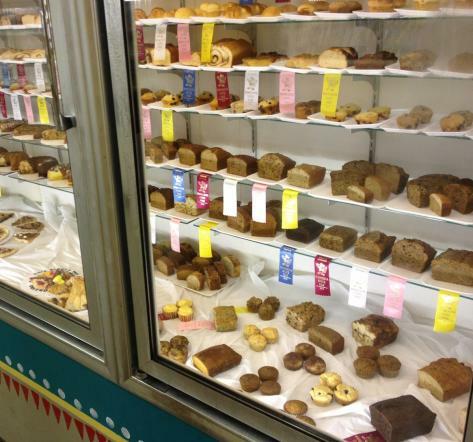 Every August, I ogle the displays of honey jars and pies, breads, and cookies behind glass at the State Fair. It always feels like those same pies have been there since 1925, as if the State Fair were some sort of Baking Brigadoon that appears once a year, but doesn’t actually experience the passage of time itself. I’d entertained the idea of entering one of the baking competitions for the past nine or ten years, but I never came close to following through until this year. The stars aligned, I had perfected a recipe over the winter, my boyfriend emailed me the application with a friendly nudge or two, and there was still time to enter. This could be my big comeback! The Rules and Premiums for entering the State Fair Creative Activities Competitions are written up like an old-fashioned legal document, but it is a great read I only entered one item, but I could have entered up to twenty items in different categories. Some of my favorite category titles are as follows: Bread, white, no seeds; Cake, white (with egg whites); Cookies, dark, rolled flat, no frosting; Cookies, chocolate chips, with nuts, no fruit. These titles gave me a sense of how specific the categories are, and also an understanding that this was serious stuff. That intuition was confirmed when waiting in line on judging day, when another contestant, Hadassa Smart said they had changed some of the qualifications for pumpkin bread this year. Reading through the variations of quick breads with every combination imaginable with or without fruit, chips, nuts, vegetables or shortening, was mind boggling. I poured myself a strong cup of coffee and read carefully. This document warranted my full attention, and a bit of either fear or reverence, or both. Even so, I was entering the contest full of glee and the tiny hope that my pumpernickel bread would find itself in the glass cabinet. I’ve been cooking on my own since elementary school and was a restaurant baker for six years, but for the last seven years I’ve been cooking and eating gluten free. It took five of those gluten-free years for me to delve into gluten-free bread baking, and last October I became determined to perfect a pumpernickel bread, one of my favorites. My first experimental loaf was a bit volcanic when it came out of the oven, but it had the essential elements of a great dark sweet rye-like bread, moist and chewy with a caraway flavor. I had my starter recipe, which led to a winter of trials, removing eggs, tweaking ingredient quantities and adding an overnight rise to develop flavor. 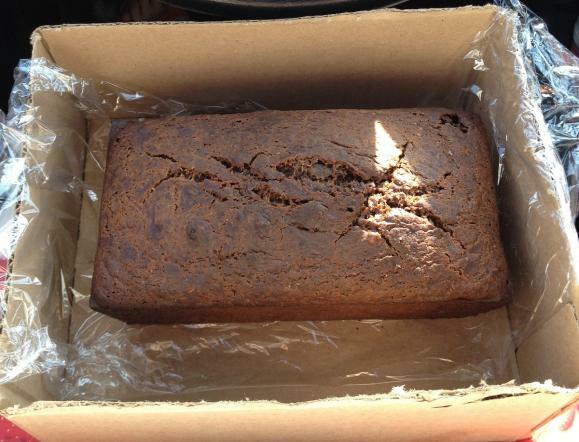 After months of feeding slices of pumpernickel to friends for feedback, the recipe was finalized. 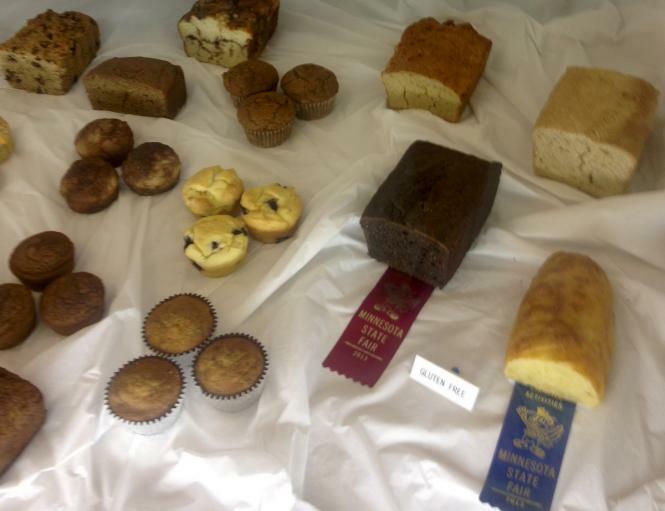 By the time I needed to bake my State Fair Entry last Sunday morning, I had baked this bread so many times, I felt confident whipping up two loaves the morning of judging. 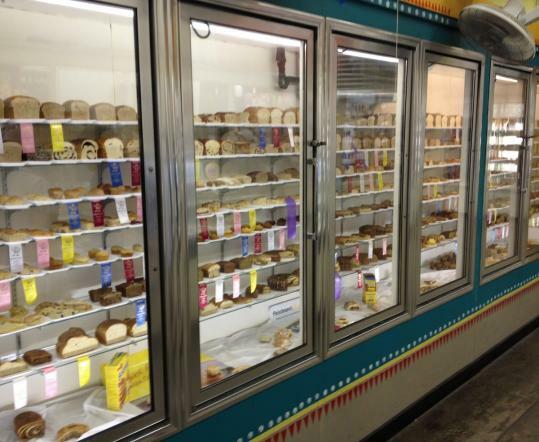 But a couple of hours later, driving my bread over to the Creative Actvities Building at the Fairgrounds in St Paul, it looked a little bit more humble – much the way I felt. The line of people outside the building was the same cross-section you see walking around the State Fair, except each person had a box, or tupperware container, or an entire wagon full of baked goods. The anticipation pulsed off the crowd, everyone facing forward, eyes on the prize. Normally I’m filled with dread at waiting in long lines, but the length of this line was a thrill. I wanted to examine the crowd and to linger with my fellow bakers. I wanted the experience to last. There was the young guy in front of me with dreadlocks, wearing a crocheted beanie and an open cardigan over no shirt, smoking some sort of pipe and holding his white cake box marked fudgy chocolate something. There was the woman I saw driving in, hair styled, wearing dark sunglasses and carrying a short but lovely gluten-free chocolate frosted cake with rosettes. And my line buddies, mother and daughter Sue and Hadassa Smart, who were dropped unassumingly out of the side of a minivan. 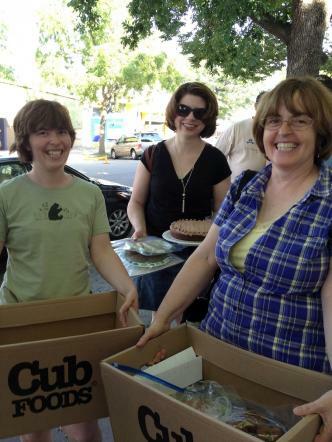 Each carried a Cub Foods box full of baked entries in ziploc bags. You’ve done this before, haven’t you? The answer was yes, and something to the effect that it’s addictive. I believed this to be true. What happened to the food after the judging? Extra was donated to shelters. Are the winning foods displayed? As many as possible, for the full 10 days of the Fair! Do the judges taste everything? No. Lots of items are eliminated from tasting by appearance qualifications, because of the large number of entries. How do you find out if you win? You can look online the morning of the first day of the Fair. Do you get any feedback? Yes, the judges’ scorecard is sent to you after the Fair. While we chatted about the famous Marjorie Johnson, winner of over 1,000 blue ribbons in baking at the Fair, Marjorie arrived herself in her signature red dress, papparrazzi following. Sue confided she won a blue ribbon once in a category Marjorie entered, and Marjorie asked her how she had done it! The young woman with the gluten-free s’mores cookies in front of me was talking gluten-free flours with Hadassa, while Sue explained the mystique of Marjorie, the procedure of open judging at the New Mexico State Fair, and how she and her daughter managed to bake all of their entries in the same oven to be ready for delivery at the same time. The three men in front of us joined in the conversation as well as the woman with the lovely chocolate cake. Master Chef and Top Chef were explained and compared, and within a half hour, we were at the front of the line. The experience was a bit like dropping a special gift to mail at the post office, but with volunteers wearing royal blue t-shirts, filing your entries away on bakers’ racks, and sending you off with your 2013 Minnesota State Fair Button. Thursday morning, the opening day of the Fair, I had to wait for the results to be posted. I’m an early riser, a baker after all. At 8 a.m., though, I scrolled down through the 104 baked goods categories, stopping to see Hadassa’s two wins and noticing certain names become familiar, as they won over and over again. 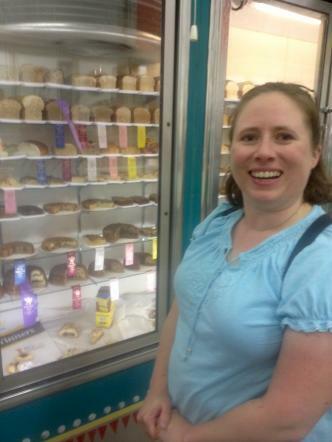 And there, under Lot 1104 Gluten Free Baking, yeast bread was second place winner Susan Patterson! Okay, there didn’t seem to be any other entries, so I retained my full humbleness, but I had won a ribbon at the State Fair nonetheless. One of my favorite things about the State Fair has always been the juxtaposition of humble and extraordinary, often within each individual entry, no matter the category. There isn’t any glossy photo-shopped perfection, but there is an authentic beauty, skill, and effort that shines through. There are the cross-sectioned loaves of sandwich bread, braided egg-breads with curvy tops, cakes with frosting dividing the layers, and the cookies and bars, six or eight per tray like the ultimate cookie exchange. Set against plain white backdrops, on white styrofoam trays, the line up of baked goods is so spare you can’t help but see the uniqueness of each one. Melissa Findlay-LampkinI met Melissa Findlay-Lampkin with her mother snapping photos of her seven prize-winning entries and her husband adorably schmoozing with the onlookers. She showed me her purple ribbon Sweepstakes-winning bundt cake, which had layers of gooey delicious looking filling. She has won blue ribbons in twenty-six categories during her seven years participating and intends to only enter contests in which she hasn’t won a blue ribbon. That leaves seventy-eight categories for her to win, including the special contests and sweepstakes. Going by the list of big winners, she could end up being like Elaine Janas winning prizes in eighteen categories or April Weinreich in fifteen categories. Nonetheless, Melissa should be able to keep busy for many years to come. And hey, there was the chocolate cake I met on Sunday! A wedge was missing and a white ribbon attached. I felt like I knew that cake, and now it was starting its 10 days of somewhat anonymous fame. Down on the opposite end of the case at the bottom was my gluten-free pumpernickel loaf, looking pretty good today with its red ribbon. But a man next to me confirmed what I was thinking. “This stuff looks so much better this week than next week,” he said. “That’s what I was wondering,” I said to him. He replied, “By the end of the week it’s like (he makes a scary face and shakes his head) eeeeyuuuuuh!” I’ll be confirming this myself at the end of this year’s run when I revisit the Fair. For the moment, though, think of my pumpernickel bread, on its first day behind glass, in its humble second place-out of two entries-perfection. In a large bowl, whisk together flours, yeast, psyllium, salt, spices and espresso powder. In a small saucepan, gently heat water, molasses, vinegar, chocolate and coconut oil. Whisk together until chocolate and coconut oil are melted completely. Check temperature of liquid mixture, when it is 105-115 degrees, add to dry mixture. Stir with a wooden spoon until completely blended. Cover bowl with a towel and leave at room temperature for 2 hours. Alternately, cover bowl with lid or plastic wrap and put in fridge up to one day. Bring to room temperature before next step. Oil a loaf pan and spread dough evenly into pan, using spatula to even out surface. Cover with towel and allow to rest for 1/2 hour. Put pan on middle rack of oven. Put small pan with several ice cubes on bottom of oven. Bake for about 35 minutes, or until internal bread temperature is at least 160 degrees. Cool at least 10 minutes and serve. Susan Patterson was allowed to make things up in the kitchen at a young age without many family members partaking of her final concoctions. With time, her experiments went from “No thanks, I’m full” responses to “Sure, I’ll take home an extra piece!” She has been working in restaurants and with food coops in the Twin Cities for most of her adult life, and she loves to teach people how to feed themselves well without a lot of fuss. 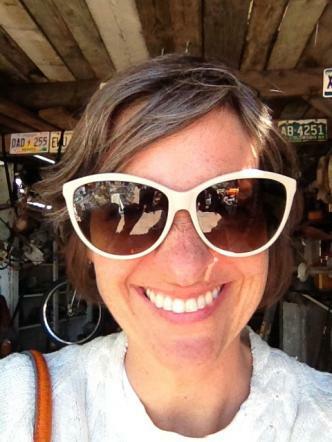 She is the owner of Lazy Susan Cooking and teaches gluten free cooking classes, leads private cooking parties and offers gluten free recipe development. Look for her website coming this fall at lazysusancooking.com. This is her first article for SGT.